How best can employees and managers adapt to today’s changing and increasingly social workplace? This has become one of the central questions as organizations look at social computing as a new primary channel in their organization, both amongst their workers as well as for their customers and business partners. While we often see traditional areas within companies — such as corporate communications, human resources, or the intranet team — being tasked with making the initial foray into internal social media, many business leaders I talk with are already looking beyond “old school” functions and trying to think through the broader implications as organizations become more social. They are also getting a sense that there is something unique and different about a social workforce. My friend and industry colleague Rachel Happe wrote recently about something she calls A Vision for the Social Organization. In this, she explores the current situation in companies today and what a social organization of the very near future might look like. Reading over this, I was struck both by the clarity of the vision and by how far off many organizations are from closing the gap between what’s now possible in terms of performance improvement and what they can deliver on any time soon. It underscores an essential point that Andrew McAfee has been making for a while now, namely that information technology is a strategic force multiplier that is inexorably “driving the leaders and the laggards farther apart” in today’s business landscape. Like previous generations of IT, this is true of social business as it was once with both the early Internet and personal computing. At the executive level, the clarion call is here. Deloitte’s new study on using social software for improved business performance has made bold pronouncements for business leaders of today’s organizations, namely that social business offers “unique capabilities to address current operating challenges and improve operating metrics”, but that skeptics will be among the very last to reap them, if they ever do. This observation and many others in top management and business circles is creating the drive to better prepare for social business. Currently, I see a confluence of core issues holding back executive teams as they attempt to determine what kind of focus on social business they need to have. Though we’re now years into the tactical adoption of enterprise social media, we’re only now seeing widespread strategic adoption that will have real effect on competitive position and long-term financial health and growth of a business. The good news for those long in these trenches is that the social business imperative is indeed being felt by most senior business leaders these days, and there is readiness to invest and make it a priority. But the way forward is too unclear for many still. From what I’ve seen, the issues, and what you can do about them, are as follows. What do new social business models actually look like and how to they apply to our business? Because most traditional organizations tend not to have deep digital roots or connections with emerging technology, there is often a fairly limited understanding of how enterprise social media has impact and could strategically affect the business. Frankly, one cause of this is because internal social business is very closely related but not quite the same as consumer social media. This means there are fewer visible exemplars to point to outside the organization and it requires the ability to adapt outside ideas to the inside of the organization. Consequently, while notions of an ‘enterprise Facebook’ can be elegant shorthand for the first step towards a more effective and better performing organization, it’s too hard for those unfamiliar with the tools and approaches of social business to extrapolate beyond this and clearly understand the bigger opportunities. Fortunately, at this point, there are strong examples in just about every part of the business spectrum to point to, whether that is your industry, or a specific function like workforce collaboration or innovation management. The hardest part about social business is changing your thinking and I encourage to refer to earlier explorations of the fundamentals such as Communicating the Value of Social Business and Social Business: A Case For Disruptive Transformation. 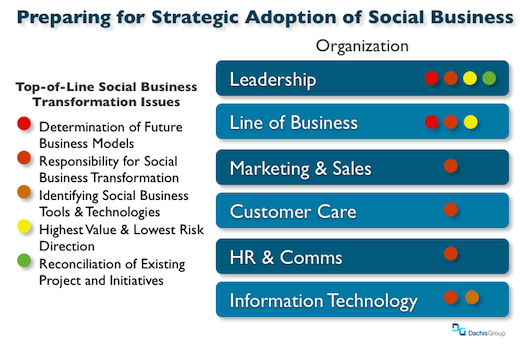 Is there a way to determine which social business approaches will have the largest benefits with lowest risk? This is the part where demands are made for case studies, industry comparisons, and executive surveys, and other data to support what is working for other organizations, as opposed to self-determination of what’s best. In reality, the companies that are already getting significant rewards today (and there are quite a few now) aren’t eager to report how they achieved them to their competition. In the meantime, executives will frequently wait until they have enough information to have high confidence in their social business direction. While strategic analysis and careful research can certainly help address this issue, there is little replacement for actually developing capability and discovering how to create value through real-world application in your own business. Yet this also isn’t a recipe for enterprise-wide change. I don’t advocate half-hearted, poorly resourced experiments (see our debate here about failing fast) nor will bet-the-farm, all-or-nothing approaches be acceptable to businesses either. It’s far more likely that supporting and resourcing continuous local change across the organization will result in the most sustained and long-term effect, along with near-term strategic transformation of targeted products and services. For more detailed information, I currently recommend spending some time with The 2.0 Adoption Council, the world’s largest group of firms sharing knowledge and lessons learned on the strategic embrace of social business. What are the best tools and technologies for engaging in social business? For companies, and large ones in particular, there is almost inevitably a focus on selecting one social business tool to rule them all. These days, it should be clearer to a growing number of organizations that there just is no one social business tool, just like there is no one IT application. While there are certainly economies of scale and other advantages to a common platform, we are exiting the era of massive application suites and entering an interesting space where social business software will either be 1) true social delivery platforms complete with their own app stores of vertical social software, and/or 2) regular business applications that have forged deep connections to the most popular/relevant consumer and enterprise social networks. Either way, the technology discussion can become a significant management distraction because the technical issues either seem beneath executive purview, there are multiple vociferously competing vendor camps, or the platform issues appear to be beyond the ability for non-technical managers to understand and direct, so paralysis sets in. In fact, it is the organizational, cultural, and behavioral issues of social business transformation that require as just much attention as the selection of technologies, and this is the best place for leaders to focus. It’s also good to keep in mind that the pace of technological change has the potential to overcome any short-term decision on platform. Instead, executives should spend their time preparing for the business part of social business, with attention to technology primarily in terms of whether it will address the capabilities they need to support desired changes. Who should be responsible for realizing social business transformation? This has become one of the most frequent questions I receive: “Where does all of this belong?” There seems to be no natural location in the org chart for social business. Should it be in corporate comms or HR? Or should IT be in charge of it? How about the line of business? Unfortunately, none of these have the combination of organization-wide support capability, expertise in specifically what the business does, and actual experience in social business strategies and tools. I’ve discussed this challenge before in Introducing The Social Business Unit, namely that 1) it’s likely that a new organizational function needs to be created and 2) that social business skills and know-how be driven directly into the broader organization, starting in places where the business is most impacted by external changes in the marketplace. Short answer: Start with an internal social business committee composed of all the stakeholders and spin it off as an internal, independent group when it makes the most sense. How should we reconcile new social business initiatives with [insert existing project or function here] (i.e. intranet, portal, document management, search, HR services, CRM, ERP, supply chain, etc.) One of the biggest obstacles of them all turns out to be that social business will impact existing areas of responsibility and ongoing projects that have deadlines that internal and external customers may be counting on. Decisions and actions that require other decisions to be rethought or undone can have the most chilling effect at all when it comes to driving social business transformation. Analysis paralysis is just one manifestation of this issue. Another is the inevitable power redistribution as fiefdoms and political boundaries are rethought and recast as social business transformation changes the way things work, from how customer care operates and employee hiring takes place to how product innovation and development is realizes in a social organization. For this issue, the answers can be tough but often boil down to letting existing projects finish and then reconcile with the social business strategyy, while looking for easy opportunities to integrate them earlier. Often, however, the answer is to pause existing investments and move them under growing social business efforts before too much time and resources are spent on outmoded work. Of course, there are other issues that organization have as well, but I believe this is a useful snapshot of the most common and significant ones that will have to be addressed as organizations plan for their future. I would be very interested in hearing in comments below from those that are encountering their own set of discussions and use this as a starting point to share and work through the fundamental issues the companies are encountering as they begin the strategic voyage to becoming social businesses.